Trove Tuesday: How Old is Elderly? My great great grandfather Benjamin Alfred Smart LATTER (1834-1903) was mentioned in newspapers many times. This is the only time that I have seen him called “elderly”. The fact that he was lifting a wagon out of the mud when injured makes this description rather surprising. Author MaureenPosted on December 8, 2015 Categories LATTERTags #TroveTuesday, Benjamin Alfred Smart LATTER2 Comments on Trove Tuesday: How Old is Elderly? One particular line in this article published by the Mount Alexander Mail in 1861 caught my eye today. 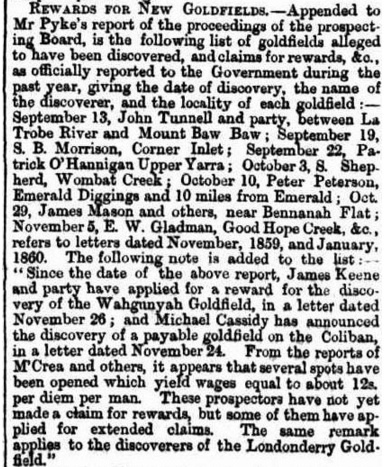 It said that someone called Peter Peterson had put a claim in for a Government reward for finding gold at “Emerald Diggings and 10 miles from Emerald”. This was rather unexpected as most of the stories about the early mining discoveries in the area refer to a “Jack Emerald” who was supposedly murdered after discovering gold – or perhaps emeralds – in the area in the late 1850s.